As I will point out in an article soon to follow this one about DIY pochade boxes, there are a lot of blog posts and videos out there that offer do-it-yourself instructions for making outdoor painting kits, from simple watercolor kits in a bag to complex pochade boxes with drawers and panel carriers. Unfortunately, most of them, however well intentioned, suffer from poor, spotty or incomplete instructions. In the case of YouTube videos, they are often shaky, handheld clips with low production values and little or no editing. There are a few exceptions, but not many. At the other end of the spectrum we have James Gurney, who has been creating a series of instructional videos with high production values and an eye to teaching in a manner that is well thought out and pays attention to detail. Though not free like most of the YouTube videos, these are very modestly priced as digital downloads, and well worth it in terms of actual usability. Gurney is not only a painter, illustrator, videographer and writer, he is an inveterate maker and inventor, constantly searching for better, more clever ways to do things related to painting and illustration. A sketch easel, as opposed to the more common pochade box, French easel or field easel, is a portable painting platform that mounts to a photographic tripod and is primarily associated with sketching and painting on location with water media rather than with oil. Instead of a recessed palette surface for oils, the provision is usually for holding a plastic or metal watercolor tray. The easel back is designed to lay relatively flat and is suited for holding a sketchbook or watercolor block rather than a plein air oil painting panel. Here, Gurney has given instructions for creating his own painting setup, one that he has refined over time and that you may be familiar with if you have seen his “Painting on in the Wild” videos, or are a visitor to his always excellent blog, Gurney Journey. In this hour long video, Gurney gives detailed specifics of how to replicate his portable sketch easel, from materials list, to layout of the wood, to cutting and finishing the pieces, making inserts for hinges and tripod mounting hardware, as well as his method of quickly mounting and dismounting a metal painting tray and water cup with embedded magnets. He also details creating sun diffusers — both a small one mounted directly over the easel, and a large one held on a separate tripod (he even builds one out of a tree branch and a sheet). At the end of the video, he shows his finished sketch easel in action in some location painting clips. These plans and instructions are very specific to Gurney’s particular setup and way of painting in the field, and are best suited to someone comfortable with DIY projects and hand tools. The HD digital download of the video is $14.95 and includes a link to a PDF parts list. The DVD version is $24.50 and includes an additional slide show. There is also a materials list on Gurney’s blog. "Your DIY Pochade Easel Designs." One of the most fascinating ways to see into the mind of an artist is to have the opportunity to look through their sketchbooks. This is not often possible; sketchbooks are frequently personal, full of unfinished thoughts and experiments and seldom volunteered for display by the artists themselves. When the opportunity does arise, it’s a treat, as well as being instructive for fellow artists in a manner similar to watching an accomplished artist work. I’ve had the pleasure of meeting author, illustrator and plein air painter James Gurney on a few occasions, and I’ve had an opportunity to briefly look through a couple of his sketchbooks. Gurney’s sketchbooks are filled with location sketches from his extensive travels, as well as his day-to-day activities in his home town. He is an inveterate sketcher in watercolor and gouache, and he records what he sees, whether a classically beautiful scene in the mountains, of the view out the window of the waiting room for a tire service center, painted while waiting to have tires changed. He is so accomplished that even his most impromptu location sketches are lively and beautifully rendered. I found myself wishing that I could spend more time looking through his sketchbooks at leisure, and thought that they would make good subjects for publication of some kind, perhaps offered as PDFs if not printed books. I was recently pleased to find out that Gurney has apparently been thinking along the same lines, only much in advance of what I was thinking, when I received a review copy of a new app for iOS and Android that Gurney has developed in cooperation with his son, Dan Gurney. The Living Sketchbook is an app that provides a virtual sketchbook experience. Not only does it allow the viewer to go through the pages of a sketchbook, but also includes audio, and sometimes video, commentary by the artist about the pieces, as well as giving access to additional information about the painting, subject and materials. It’s the next best thing to going through a sketchbook while standing there with the artist as he comments on it for you. I’ve done some iOS app development myself, as well as creating numerous web interfaces in my role as a website designer, and I will give the app a big thumbs up for the accommodating the most important factor in an interface like this — presenting the material in an easy to use manner and then getting out of the way while you enjoy. It’s hard to overstate how many apps, websites, games, gadgets and desktop applications get that wrong. At the moment, The Living Sketchbook ships with one sketchbook included, this one is called “Boyhood Home”. Gurney names his sketchbooks, and enjoys creating fun hand painted typography for their covers. The app allows you to simply thumb through the images as if through a physical sketchbook, and at will pinch to zoom into the image. Unlike some poorly designed interfaces for viewing images (I’m looking at you, Instagram), Gurney’s app allows the zoomed image to stay at full size when you let go, and programming by Dan has even provided some subtle touches of physics in the reaction of the scroll as you nudge the image around in the window. You can also access a row of thumbnails at any point as well as bring up an overlay of information about the painting. The Living Sketchbook is $4.99 and is available for iOS and Android. You can find links to the app for both platforms in this article on Gurney’s blog. There is a trailer and teaser for the app on YouTube, that give a better idea of how the app functions, and Erwin (Cherngzhi) Lian, who knows a few things about sketchbooks, has a more extensive review on his blog. It may be restricted to relatively current versions of the operating systems, so if the respective app stores don’t allow you to purchase it, that may be the factor. I couldn’t view the app on my older iPad 3 (Retina), because it’s too old to run the required version of the OS, but I could view it fine on my newer iPhone 6. So bear in mind the the screen captures used for my exmaple images above are from an iPhone, and the app will view quite differently and more effectively on a tablet. I was actually surprised, though, at how effective it is to view zoomable images of the paintings on the relatively small iPhone screen. I can easily see popping an app like this open for inspiration while taking a break when out location painting. I’m already looking forward to the release of the next sketchbook. Just to put things in… context, the history of graphical perspective goes back further, but the system of geometric perspective we use today can be traced to an important point in the beginning of the 15th century, when Filippo Brunelleschi — the brilliant Renaissance architect and designer who solved the seemingly intractable problem of spanning the world’s largest cathedral dome space with an ingenious solution — codified a system of graphical persepctive that was immediately adopted by almost every artist who was made aware of it, and most artists since. Like his solution for the dome of the Florence cathedral, the model of geometric perspective Brunelleschi demonstrated solved problems that had previously seemed impossibly difficult. Artists and art students have either been thanking or cursing him ever since, depending on whether they see graphical perspective construction as an an incredibly powerful tool or as a burdensome learning process akin to school studies of math or chemistry. Linear perspective study can seem difficult when ill-presented, but when taught properly, it can be a golden key to drawing and painting with a strength, solidity, accuracy and realism impossible to achieve without it. Short of taking a course with a good instructor, those interested in mastering perspective are left to find their own way with books that are too often poorly presented, overly obtuse and almost as boring to look at as a mathematics textbook. While there are some pretty good perspective books out there, I’ve just received review copies of a new two-volume set on perspective that has shot to the top of my personal list of best books on the subject. Framed Perspective Vol #1 and Vol #2, are new books from Marcos Mateu-Mestre, a concept artist and illustrator who I have written about previously and whose drawing style I have always found particularly appealing. As in his previous book: Framed Ink: Drawing and Composition for Visual Storytellers (link to my review), he tackles the the subject within the framework of real world use and practical application. Also like that book, Mateau-Mestre has not only used real-world type examples to illustrate the concepts, he has also used them to make his books something that perspective books rarely are: visually appealing and entertaining. Framed Perspective Vol. 1 is subtitled: “Technical Perspective and Visual Storytelling”. In it Mateau-Mestre starts at the ground floor (so to speak) and takes you from the basic concepts through solutions for some reasonably complex challenges, including multiple vanishing points, staircases, three-point perspective, arches and domes, and the application of perspective to freehand sketching. At over 200 pages, it’s packed with information and techniques and a reality-based approach that stays focused on what’s really useful. Framed Perspective Vol. 2 is subtitled “Technical Drawing for Shadows, Volume, and Characters”, and deals with the too often neglected subjects of applying shadows in perspective and applying perspective to the human figure, including the representation of clothing and folds, and the application of shadows to figures. Though not as extensive as Volume 1, this one still weighs in at over 120 pages, and is jammed with useful information, as well as Mateu-Mestre’s wonderful drawings and illustrations. Throughout both volumes, the illustrations, diagrams, text and book design are clear, concise and well thought out. Any artist with an interest in comics, graphic storytelling, concept art or illustration — as well as painting and drawing of any kind that involves linear perspective — should look into these superb volumes. If you’ve found books on perspective daunting and/or boring, Framed Perspective may open your eyes to a world of possibilities for understanding and using one of an artist’s most powerful tools. Casein (pronounced “kay’ seen”) is a water based paint in which the binder is the milk protein of the same name. Casein is one of the least familiar of the water based painting mediums available to contemporary painters, even though it’s one of the oldest painting mediums known. Casein’s use can be reliably traced back over 9,000 years, with evidence of the formulation in cave paintings, and examples have been found in ancient Egyptian tombs from several thousand years ago. Casein has a varied history, frequently used as an underpainting for oils and achieving its greatest modern popularity as a stand-alone medium in the mid 20th century, when it was popular with illustrators for its quick drying time, workability and easy-to-photograph matte surface. Like it’s gum arabic based cousin, gouache, the use of casein by illustrators was largely eclipsed by acrylic, which quickly dries impervious to water and subsequent applications of paint layers. Casein has been in use as a decorative paint for furniture and other items, where is is generally referred to as “milk-based paint”; I’m not sure if the formulation is different from the artists’ paint. Casein has also been used as a ground for oil paints and for silverpoint drawing; the binder itself is a glue, used in undiluted form to glue furniture. Casein has an interesting place in the spectrum of artists’ paints. It most closely resembles gouache as an opaque water based medium that dries to a beautiful matte finish. Like gouache, it changes value somewhat — generally lightening — as it dries. This can take a little getting used to and it can take multiple layers to produce satisfactory darks, but I find that more than offset by casein’s other qualities. Casein is more full-bodied than gouache, and can be used a bit more thickly (though not in heavy impastos like oil). This makes it a little more like oil in terms of scumbling and creating interesting surface textures, and it can be particularly appealing to oil painters who want the speed and convenience of an alternative water based medium. Casein also has a particularly nice characteristic of flowing off the brush, and can be applied to a smoother and more even flat color surface than gouache. Some have said they’re not fond of the scent of casein paint, but others, including myself, find it quite pleasant. Your mileage may vary. Unlike gouache and watercolor, which can always be reactivated with water (either an advantage or disadvantage, depending on the artist’s needs), casein eventually dries to a surface more resistant to water. Varnish can be applied to paintings that have dried for two weeks or so, either matte or glossy, the latter application bringing out the darks and giving the painting a look closer to oils. Care must be taken, though, not to disturb the surface when applying the varnish; you’ll find more detailed information on some of the sites I’ll list below. Like gouache, casein is being “rediscovered” by contemporary artists, and appreciated for its unique characteristics. It is particularly suited, I think, for plein air painting. “True” casein must be made up frequently by the artist, as it goes off in a day, or 4 or 5 if refrigerated. Modern adoption has been greatly boosted by the availability of casein emulsion, a formulation of casein and drying oil that does not readily spoil and is available in tubes. To make “true” casein, vinegar is used to separate out the liquid whey, leaving the curdled milk protein — essentially cottage cheese. This is dried and ground to a powder for future use or used immediately, and usually mixed with water and ammonium carbonate or clear liquid ammonia (though there are other formulations using lime or borax). The result is a milky fluid into which powdered pigments are mixed to make paint. Already extracted and dried casein powder can be purchased from suppliers like Sinopia, Kama Pigments or Earth Pigments (recipe here). The tube casein seems to have most of the wonderful working qualities and beautiful surface appearance of the fresh made version, and is certainly an easier approach to the medium. 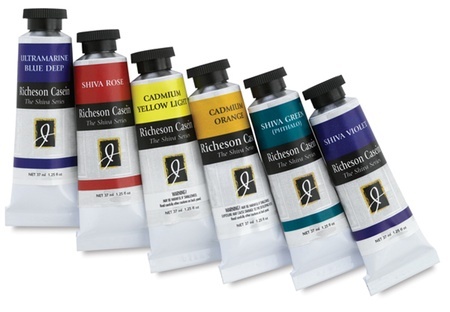 Jack Richeson & Co. is the most prominent provider of commercial casein paints, having bought the “Shiva” line and name from the previous manufacturer. Their casein emulsion paints are available through most online art supply houses, though I understand that they may be difficult to find outside the U.S.
Plaka, by Pelican, is another brand of casein based paint, that I know is at least available in the UK, though it may be aimed somewhat more at decorative artists than painters. Casein is generally less expensive that gouache, perhaps because the binder and formulation of pigment is less costly, I don’t know. It comes in large tubes of 37ml, similar to oil, as opposed to the small tubes favored for watercolor and gouache. Casein, even more than gouache, is brittle when it dries, and if used thickly, should be used on a heavy watercolor paper, or ideally on illustration board or panel. Ampersand, which makes familiar painting panels for plein air artists, makes a line of Claybord, that they promote as being ideal for casein and gouache, largely because the clay infused primer is absorbent, rather than non-absorbent as is favored in surfaces for oil painting. I haven’t tried it yet, I’ve been working successfully so far on 140lb watercolor blocks and hot press Bainbridge Board (I use hot press because I prefer a smooth surface). To a point, casein washes up like watercolor or gouache, but because it hardens to a water resistant form over time, more care must be taken to wash out brushes after painting, or keep them suspended overnight in a brush washer. Casein is also a little rougher on brushes than watercolor or gouache, and it might be considered preferable to use synthetics. Because of the thickness of the paint compared with watercolor, casein painters often use brushes labeled for acrylic, somewhere in between stiffer oil brushes and softer watercolor brushes. It can also be a little more difficult to get brushes clean, I use a little Murphy’s Oil Soap, I’ve also heard Greek olive oil soap recommended. Casein is well suited to be used with gouache, the former giving body and texture, and the latter being even better for fine detail and sharp lines (though casein does well on its own in that respect). Casein is often used with other paints, notably acrylic, in which acrylic plays the role of thin, transparent application and casein provides the ability to easily create thick, opaque passages — similar to the way watercolor and gouache are often used together. There is a National Society for Painters in Casein and Acrylic, which sounds promising, but the navigation in their online galleries of competition winners is so terrible as to be almost unusable. You have to click to enlarge an image in a pop-up just to see the artist’s name, and even then there is no indication of the medium. You have to either look up each artist in Google and go to their own sites to look for the medium, or look for the winners of the “Richeson/Shiva Award For Casein Painting” as you wearily pop-up and close, pop-up and close, pop-up and close, in an attempt to find the few casein painters among the predominant majority of acrylic artists. Unfortunate; it might otherwise be a good resource. Also unfortunate, and similar to gouache, is the dearth of information on casein use and painting techniques compared to other painting mediums. The Richeson site provides some information, and you can find casein mentioned in art materials compendiums, like Mark David Gottsegen’s The Painter’s Handbook, as well as in older books on illustration materials, like Rob Howard’s The Illustrator’s Bible. A number of artists who work in casein feature short informational pages about the medium on their websites, and I’ll list some in my links, below. By far the best source I know of is James Gurney’s blog, Gurney Journey. Gurney has for several years been working with casein, as well as gouache and other mediums, and has been sharing his experience and findings in the form of articles and short videos. He has just released a new full-length instructional video, Casein Painting in the Wild, which I cover in a separate post. One of the segments of his video demonstrates painting in a very limited palette of four colors, and artists who are curious about casein may want to try a similar approach to simply try out the medium. Personally, I find casein to be a genuine pleasure to work with. I like the way it flows and handles, the textural possibilities and the appealing color and matte surface in finished paintings. Artists who try it may be surprised at how nice it can be to work with. Gurney Journey, general search for "casein"
Casein is a water based paint that uses milk protein as its binder. It shares many characteristics with gouache; both are water-based, opaque and dry to an appealing matte finish. Both dry quickly and can be used in concert with other water based mediums. Both are neglected step-children of watercolor and are somewhat on the fringes of awareness among painters — undeservedly so. Partly, this may be because they don’t get much attention in popular media, and they suffer from a shortage of instructional material. 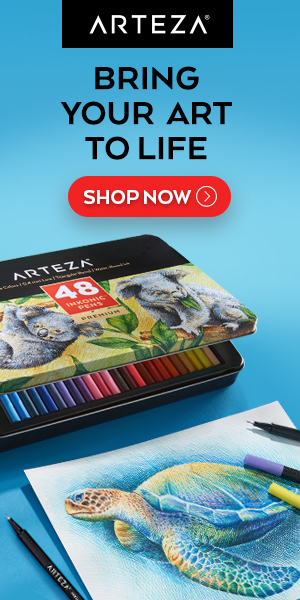 This is where contemporary painter, illustrator, writer and instructional materials creator James Gurney comes in. Gurney has long been an advocate of the use of casein and gouache, and his blog, Gurney Journey is one of the best sources of information of both mediums. Gurney has just released the the latest addition to his excellent series of instructional videos on painting “in the wild” with water based mediums, Casein Painting in the Wild. In it, he takes you through 7 location paintings, discussing the process in his laid-back, conversational manner, with lots of helpful close ups of paint application and brush handling, as well as occasional split screens of the subject and painting. He also discusses materials and gives and overview of the medium in general. Though it’s focused on painting in casein on location, the techniques are applicable to gouache, which is readily used in conjunction with casein, and many of the basic principles he covers are relevant to other painting mediums. Given the frequent $70 – $100 or more price range of other artist instruction videos, Gurney, by acting as his own camera operator and post production studio, can offer quality videos like this for a bargain price of $15 (for the downloadable version). I purchased my copy as a downloadable file from GumRoad, though the video is also available as a disc from other sources (see this article for information). As always, the video is generously supplemented by additional material on the blog, such as a specific post about readers’ casein questions. There is a trailer and excerpt videos on YouTube as well as in several articles on Gurney Journey. Like Gurney’s other instructional videos on water-based mediums, Casein Painting in the Wild leaves you enthused to load up your brushes and have at it, indulging in the unique qualities and pleasures of this unfairly overlooked method of painting. For those who are dismayed, as I am, at the recent turn of events, and the likely devastating effect it will have on the state of the arts here in the U.S. (see my before the fact storm warning to that effect), I offer some insightful suggestions about art in the face of adversity from writer Neil Gaiman. 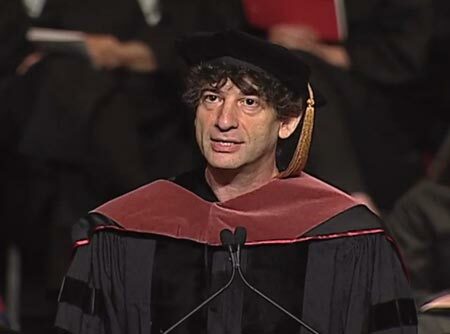 This is a video of his remarks as he addressed the graduating class at the University of the Arts here in Philadelphia in 2012. He doesn’t really get to the point until about 6 minutes in, but do yourself a favor — set aside 20 minutes, pour yourself a hot (or cold) beverage, relax, and watch the entire address. It’s amusing, well crafted (he’s a good writer), and will leave you feeling better about your course as an artist in troubled times. It’s also — as it was intended to be — sage advice for those who are starting out on a life in the arts, as well as a reality check for those who are already achieving success in their field.